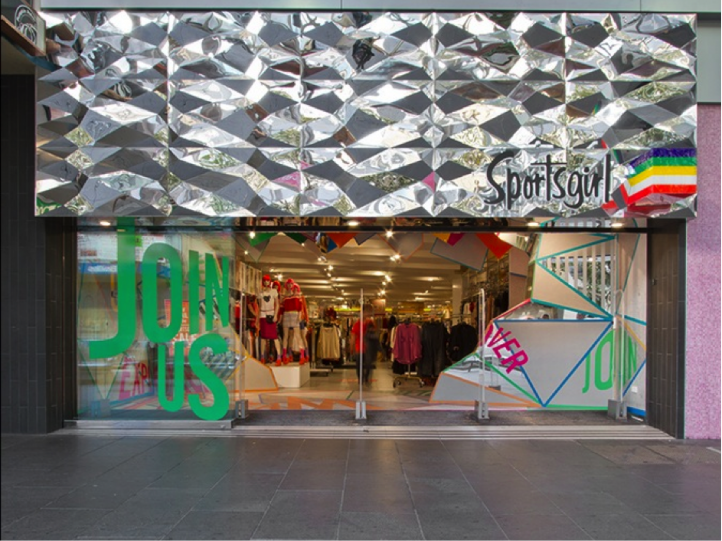 Designed by renowned UK Architects HMKM, this first Sportsgirl Super Flagship Store is located in a former movie theatre in the Bourke Street Mall. Maben Group provided base building construction management services to undertake the extensive demolition and reconstruction works. Significant structural works were undertaken to remove the existing lift and escalators, and create a large open ceiling space within the store. The descending roof of the original theatre was opened up to incorporate a 10 metre high atrium ceiling wrapped in diamond lattice work – which allows natural light to cascade through its large, glass panel skylights. .
Maben Group worked closely with Sportsgirl to provide project management services to facilitate the design and manage the fitout works which were completed by JRB Shopfitters.